Read the original article on the BBC. This is the story of the man who migrated twice. Who dodged the police along the Italian border with France – twice. Avoided officials on the train to Paris – twice. Made it to the shanty town life in Calais – twice. Risked death as he stowed away on a vehicle to Britain – twice. Now he waits for the British asylum process to decide whether he can stay. Yes, again, for a second time. It is a story of the determination to make it to safety – wherever that is perceived to exist – and of why Europe’s migration crisis is only deepening. Let’s call him Adam, because he doesn’t want me to use his real name, and because it’s a popular name in Darfur, South Sudan, from where he comes. He calls himself a “village man”. But today, in a smart well-ironed shirt, Adam looks at home here in the UK, although the UK has become anything but home for him. Adam left Darfur in 2012, made his way to Libya, and spent some years there. But as that country crumbled, he felt propelled onwards, to Europe. He followed the route so many take. Sicily to Ventimiglia in northern Italy, on to Paris, then Calais and then finally Britain. Only it was not finally. He was detained by the authorities, put into indefinite detention for four months, then released. He was then arrested again, detained this time for two months before it was decided that he should be sent back to Italy because there was a record (his fingerprints) that he had first arrived there. “They put me in handcuffs,” Adam says. Four officers accompanied him back to Milan and left him there. “I stayed 10 days in Milan, on the streets.” That was when he decided to go back, first to Ventimiglia, and this time round it was harder. Finally he stepped on to the railway tracks and started walking. “I just walked from Ventimiglia to Cannes for like eight hours.” From there to Paris again and on to Calais. It was more difficult there too. The previous year “it was better. But this time was more difficult because many people (had) come and many police officers (were there) to stop people”. One month and one day after he had been deported from Britain, he was back. But this is not the end of Adam’s story. Determination, desperation, there’s no one word that encapsulates fully what you find today along the trail that Adam knows so well. His analysis, that it’s getting harder to cross borders, is echoed by others and this is why. Italy has become the go-to country for those seeking to come across the Mediterranean. The Turkey-Greece route is all but shut down following an agreement between the EU and Ankara. This year, more than 93,000 migrants have arrived in Italy according to the United Nations. An EU-wide relocation scheme that should have taken the pressure off Italy has moved fewer than 8,000 since it launched almost two years ago. Rome is trying to do deals with Libya to stop the boats launching in the first place – but there’s no central figure of authority in that war zone. They want other countries to open ports in the Mediterranean to migrant and rescue boats – France and others have said no. The asylum process is stretched to breaking point. Shelters can’t accommodate everyone. 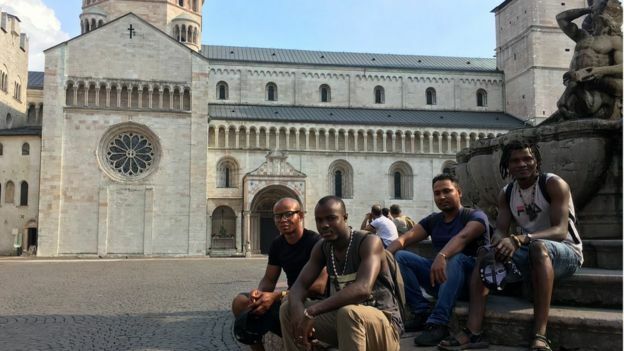 In Trento, towards the Austrian border, four men, from Bangladesh, Ivory Coast, Ghana and Nigeria, told how they have waited almost three years in limbo – unable to work – not knowing if their final appeal will grant them the right to remain or not. The likelihood is they will not be deported, even if their asylum appeals fail. Few are actually sent back. Instead they are stuck, unable to work, or provide for themselves. All this – and the poor state of the Italian jobs market – explains why so many decide to move on from Italy. And with numbers growing, that is why Austria to the north and France to the west have both put in more frequent border checks. The people they are trying to stop gather every morning for a small free breakfast at a refuge in the Italian border town Ventimiglia. Among them on one day recently were Nasser and his two-year-old son Aladin from Sudan. Aladin – still in nappies – is ill and they desperately need a doctor. On the small winding roads through the hills to France, the police check vehicles for stowaways before you can cross the border. They have set up camp in the olive groves up on the hillsides to keep watch for those trying to get across. Occasionally a patrolling helicopter passes overhead. For France too is “overwhelmed” – that’s the word the new president uses – and is trying to stop people coming on to its territory. In the capital a week ago, they moved thousands off the streets around a metro station into shelters, but now another thousand are back on the streets, according to the deputy mayor, Patrick Klugman. The French prime minister last week announced a series of new measures – cutting the time it takes to process asylum claims, “systematically” deporting so-called economic migrants and building more shelters to house refugees in the next two years. However, Mr Klugman says it is not enough. 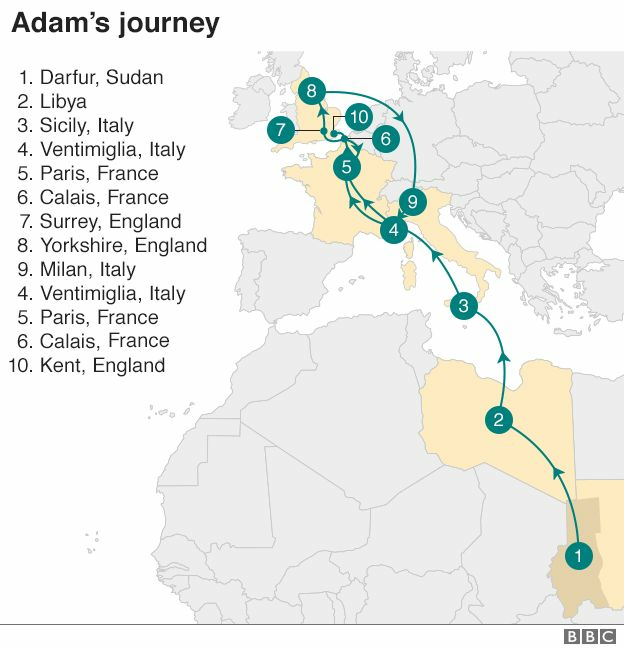 Only a tiny number of the hundreds of thousands of migrants and asylum seekers in Europe follow Adam for the whole of his journey and cross from Calais to the UK. We don’t know how many of them do it twice. As for Adam, there is no happy ending to his story. It has been around a year since he had his last interview in his new asylum process. Since then he has been in limbo, not knowing whether he will be deported again, or this time be allowed to stay. He has a room to stay in – paid for by the government – and £75 a week to live off. He is not allowed to work. And he says it feels as if he is still on his journey, heading where he does not yet know. Ethiopia seems to be attracting the attention of economists interested in Africa, and for good reason. Except for Rwanda, Ethiopia is the only African country whose economic growth has been consistently high for more than a decade without relying on a natural resource boom. Between 2004 and 2014, per capita growth in Ethiopia was 8% per year. This was the highest on the continent during this period, and is impressive by any standard. The growth has been attributed mainly to a construction boom and increased agricultural productivity. But manufacturing has also been vital. It has grown at 11% per year and manufacturing exports increased more than elevenfold. This was largely thanks to the increasing export earnings of the footwear and apparel industries. The growth represents more than a doubling of manufactured exports’ share in total merchandise exports, which itself more than quintupled during the period. Nevertheless, manufacturing as a share of gross domestic product in Ethiopia remains 5%, well below the African average of 10%. The country also scores below the African average on diversification, export competitiveness, productivity and technological upgrading. Despite this, it’s not a long-shot to predict that Ethiopia will catch up with countries like China and Vietnam in some low-tech manufacturing industries in the near future. These are industries for which labour costs are very important. And right now you’d be hard pressed to find a country in the world that has cheaper labour than Ethiopia. Even beyond these obvious industries, there are reasons to believe that Ethiopia might be on the right track to catch up with more advanced economies. First is the country’s developmental orientation. In many ways it resembles that of successful catch-up experiences in East Asia, such as Korea and Taiwan, with a relatively “authoritarian corporatist” structure and centralised economic planning. Meles Zenawi, Ethiopia’s recently deceased prime minister who ruled from 1995 to 2012 and whose legacy remains strong in today’s ruling political coalition, repeatedly expressed admiration for the East Asian experience. He stressed that its success was based on a prudent combination of market forces and state intervention. The state not only provided basic infrastructure and services but also a conducive environment for the private sector. The second reason to be optimistic about Ethiopia’s prospects is the impressive industrial policymaking capability it has accumulated since the Ethiopian People’s Revolutionary Democratic Front government came to power in 1991. The quality of this capability becomes clear if you read the Growth and Transformation Plan covering 2010-2015. According to economist Kenichi Ohno the plan is unusual in its brevity, coherence and strategic direction. Priority manufacturing industries were designated based on resource availability, labour intensity, linkages to agriculture, export potential and relatively low technological entry barriers. They include apparel and textiles, agro-processing, meat processing, leather and leather products, and construction. Supporting institutes have been set up for each industry to coordinate the value chains effectively, for example by ensuring efficient supply of inputs to manufacturers and to assist firms with technological upgrading. Two state-owned banks, the Commercial Bank of Ethiopia and the Development Bank of Ethiopia, provide most credit to firms in these industries. Foreign banks are simply not allowed to operate in Ethiopia. The understanding is that they will be allowed in only when domestic banks have developed the capacity to compete. While the Ethiopian government is formulating policies to support specific industrial sectors, for most of the past 20 years the federal budget has been devoted to policies that are more “horizontal” in nature, like education and infrastructure. Results so far are impressive. Enrollment in primary schools has increased from below 20% in the early 1990s to about 94% in 2012. The number of universities has increased from one in 1990 to more than 30. And the government has invested massively in infrastructure development, focusing on transport and power generation. The road network expanded from 26,550km to 53,997km between 1997 and 2011. The country is set to quadruple its power generation capacity when the Grand Ethiopian Renaissance Dam on the Nile is finished in 2017/18. One of the largest hydroelectric power stations in the world, the dam will generate 6,000MW. Feeding on the boom in construction, cement production has grown dramatically since 1999. The average annual growth of cement production has been more than twice the world average. As a result, Ethiopia is now the third largest cement producer in Africa. State support has been both direct and indirect. Direct measures include entry incentives for domestic firms, like long-term loans for capital investments, easy access to mining resources and the allocation of foreign currency on a preferential basis. Additionally, government provision of transport and energy has been crucial. Like the cement industry, the Ethiopian floriculture sector has made important contributions to overall economic development. Cut flower exports increased from three tons in 2003/04 to more than 50,000 tons in 2011/12, substantially raising export earnings. From 2007 to 2012, the sector’s employment doubled from 25,000 to 50,484. The industry grew from a single firm in 2000 to about 100 in 2014. The industry has also created indirect jobs through the expansion of horticulture. Related activities, such as packaging production, cold chain logistics and air transport have all benefited. While Ethiopian firms initially kicked off the floriculture industry, foreign firms have increased their investment. In 2012 they accounted for 63% of all firms operating in the sector. This foreign investment has contributed to technological development and improved market access. Foreign investors say Ethiopia has become an attractive investment location because of natural endowments such as land and altitude, cheap labour and government incentives. These incentives include tax holidays on profits for up to five years, duty free privileges on all capital goods and the provision of construction material. Subsidized loans have been the prime source of long-term investment financing for firms in the floriculture industry. Almost two-thirds of firms in the industry have relied on loans from the Development Bank of Ethiopia. And private banks, seeing the success of these loans, have also started lending to the industry. Both the leather products and the textile and apparel sectors have been designated as top priority manufacturing industries in the recently released five-year development plan (2015 to 2020). One reason for this is because they have strong linkages with the agricultural sector as they use inputs from the livestock and cotton sectors. They are also both labour intensive, thus absorbing labour from the agricultural sector, and have major export potential and low entry barriers. five-year tax holidays on profits. Export figures from the past two years indicate positive trends for both industries. But the results are not yet near where they need to be to make a significant contribution to structural change. However, considering all the positive signs, Ethiopia might very well be on its way to become Africa’s industrial powerhouse. This article is an edited extract from Transformative Industrial Policy for Africa, a report produced by Ha-Joon Chang, Jostein Løhr Hauge and Muhammad Irfan on behalf of the United Nations Economic Commission for Africa. Botswana is a true rarity: a free and prosperous post-colonial African country. Fifty years ago this month, Britain surrendered its Bechuanaland protectorate to self-rule — just as it had Northern Rhodesia (now Zambia), Tanganyika (now Tanzania), Basutoland (now Lesotho), Kenya, Uganda, Swaziland, Nigeria, Somalia, et cetera. Each of those countries ended up unfree (like Kenya), grossly unfree (like Swaziland), or a hell on Earth (like Somalia). But not Bechuanaland. Bechuanaland held free and fair elections and became Botswana, a country with free elections, a free economy, and a free press. It is a triumph of democracy — and National Review readers, the United States, and the free world should join in celebrating its 50th birthday. The best way to understand how remarkable Botswana is is to consider its neighbor Zimbabwe, formerly Rhodesia, which became independent of Great Britain just a few months before Bechuanaland. Rhodesia declared itself independent in 1965, under an apartheid-style system of white minority rule. In anticipation of independence, a sub rosa civil war had broken out between the white minority government, the Soviet-backed Zimbabwe African People’s Union, and the China-backed Zimbabwe African National Union. After independence, the civil war intensified considerably, and it lasted until 1978, when a compromise was reached, first to include black participation in government, and then later — under British and U.N. pressure — to allow the participation of the Communist guerrilla leaders Joshua Nkomo and Robert Mugabe. International sanctions — which had been imposed in opposition to minority rule — were lifted for the newly renamed Zimbabwe’s first general election. For a moment in Zimbabwe’s difficult history, it seemed that things were looking up. Remember: South Africa wouldn’t abolish apartheid for another decade and a half. But then — despite a large international “observer force” — Robert Mugabe began a massive campaign of voter intimidation. He won in a landslide. Among opponents of Mugabe, of corruption, and of Communism, there was an outcry. Mugabe’s response was to murder thousands of Zimbabweans. His Fifth Brigade, which had been trained in North Korea and answered directly to him, was sent to Matabeleland — western Zimbabwe, where anti-Mugabe sentiments were strongest. Over the course of a five-year anti-dissident campaign, the Fifth Brigade murdered between 20,000 and 30,000 people. Afterwards, a new constitution was written, Zimbabwe’s senate was abolished, and new parliamentary elections were held — in which Mugabe’s party won 117 of 120 seats. Mugabe matched his brazen suppression of dissent with Marxist economic reforms. When Zimbabwe’s civil war ended, its future looked bright, and its GDP growth spiked from an annual average of 5 percent (through the civil war and international sanctions) to 10.6 percent in 1980 and 12.5 percent in 1981. Under Mugabe’s leadership, it crashed to an annual average of 2.7 percent. Hoping to distract from the country’s new woes with memories of its old woes, in 1992, Mugabe instituted a mandatory land-reform program, wherein land was confiscated from white farmers and redistributed. Unfortunately, Mugabe didn’t bother to make sure the people he gave farms to were farmers. Thus Mugabe destroyed one of Zimbabwe’s last functional industries. For the first time since the civil war, the economy dropped into negative growth: – 9 percent for the year 1992. And with agriculture ground to a halt, people began to starve. Of course, even if there had been food to buy, everyone’s money was becoming worthless. For the rest of the decade, Zimbabwe’s annual inflation rate averaged 35 percent. In 2001, it jumped to 112 percent. In 2002, it jumped to 200 percent. In 2003, to 600 percent. By 2007, it was 66 thousand percent. By the end of 2008, the inflation rate was 80 billion percent. At that point, one American dollar was worth 2,621,984,228,675,650,147,435,579,309,984,228 Zimbabwean dollars. (If you’re wondering how that number’s pronounced, it’s about two-point-six decillion.) At the 80-billion-percent inflation point, and after another grotesquely fraudulent election, in 2008 Mugabe agreed to start sharing power with some of the remaining opposition. And things stabilized somewhat. Growth is still low, but Mugabe is 92 — so maybe there’s light visible at the end of the tunnel. Of course, what difference does money make, when the police can pick you up, hold you, torture you, and kill you whenever they feel like it? In Zimbabwe, political rights are more or less nonexistent. And that’s if you’re a member of the majority. Things are — somehow — even worse if you’re not. Mugabe has said, “no white person will be allowed to own land” in his country. He has said some white farmers were so bad, “you would think they were Jews.” (There are only 120 Jews in Zimbabwe.) He says that gay people are “subanimal”; that they “behave worse than dogs and pigs.” “If you see people parading themselves as Lesbians and Gays,” said Mugabe, “arrest them and hand them over to the police.” But let’s leave Mugabe’s Marxist paradise behind and hop back across the border to Botswana. Despite having to make its own way after escaping colonialism, like so much of Africa and the world, Botswana has a higher GDP per capita than several countries in Europe. (Zimbabwe has a GDP per capita only slightly higher than Afghanistan’s.) Botswana’s GDP has grown steadily ever since independence — during which time its people have enjoyed both the presence of a free market and the absence of corruption. According to the Heritage Foundation, Botswana has a freer economy than Norway, Spain, and Belgium. (Zimbabwe’s economy is freer only than Venezuela’s, Cuba’s, and North Korea’s.) And, more importantly, if any citizen of Botswana objects to any of that — if he’d like, say, a Botswanan Bernie Sanders in office — he could write an op-ed, hold a rally, or go vote. All without fear of arrest or reprisal. Botswana is a free country in a tragically unfree world. It’s not perfect (if you’re reading this, Botswana — you could treat your Bushmen better); nonetheless, in its own way, it’s a light unto the nations: a testament to democracy’s power to overcome any challenge — even the adversity that accompanied the birth of most modern African nations. Perhaps even more acutely, it’s a testament to every Botswanan leader — every Botswanan George Washington — who could have seized power like Mugabe and destroyed his country, but chose instead to respect the rule of law and let his country thrive. Happy birthday, Botswana. And many more.